Pakistan and India have shared a long history of conflict. The two countries have witnessed more ups and downs in their relationship, in a relatively short span of almost seven decades, than most countries do in hundreds of years. The relationship between the two South Asian neighbours can to some extent be explained by the subaltern realist theory. According to the theory of subaltern realism, the third world states are weak and dependent, due to which their ability to focus on their long-term benefits is less that on the developed countries. As the third world countries which were established after colonialism came to an end in the subcontinent, Pakistan and India have always been dependent on bigger powers as far as their security and survival are concerned. The third world countries seek survival and are constantly in competition. Therefore, internal and external factors both act as catalysts in influencing the behaviour and decisions of these states. According to the realist school of thought, the international structure of the world is inherently anarchical. There is no hierarchy of power. This anarchy in the international system forces these countries to be in constant competition with each other. They all seek survival and security. However, in order to understand and analyze the relationship between the two South Asian giants, one has to carefully look at their relationship through the prism of three levels of analysis, i.e., systematic level, regional level and the domestic level. At the systematic level, Pakistan and India have faced conflict of interests at the geo-strategic and geo-political levels. Whether it was the conflict of disputed territories between the two or of being a part of different alliances, these two countries have always found themselves to be on the opposite sides. Pakistan and India have historically suffered from a security dilemma regarding each other’s military strength. That can be related to the alliance-formation of these states in time of need due to their dependence on developed countries. For example, Pakistan allied with the U.S. during and after the Cold War; while India, despite declaring itself as part of the Non-Aligned Movement, was being assisted by the former Soviet Union, especially in the military sector. 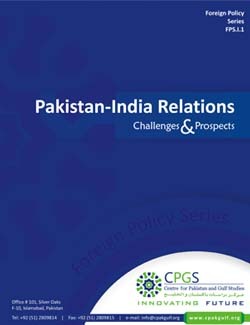 On the regional level, the relations between Pakistan and India directly have an impact on regional security and stability; this relationship is considered to be one of the most important ones in the world. The world views the relationship between the two countries of a highly volatile nature, mainly because of the traumatic ideological and political history shared by the two. This shared history between Pakistan and India comes with a baggage. The legacy of unjust partition resulted in territorial disputes and constant state of insecurity and tension on borders. The conflicts between the two countries have weighed down on the future of the two countries. Both states’ inability to solve these conflicts has raised much concern, not only within these two countries but in the world as well. One of the most important points of concern between the two countries is Kashmir. Kashmir has been and still is a constant source of tension and a potential recipe of disaster between the two countries. That is why many have termed it as a “nuclear flashpoint”; just waiting to go off. Since the inception of the two countries, there has been a huge third party interference. At times, this interference was for the sake of maintaining peace and stability in the region, while at the others it was not. Whereas some of the observers in both countries have referred to this third party interference as meddling, while others see it as a way of moving the dialogue process forward. These international actors like the United States have time and again helped propel the dialogue process forward and repeatedly urged the two countries to reach a point of detente in their relations. It should be noted that over the last decade or so, this third party interference has decreased considerably. Much of it has to do with the two countries’ resolve to solve the underlying disputes and also because of the changing geo-strategic conditions of not only the region but the world at large. These geo-political and geo-strategic circumstances involve the decline of the stature and power of the United States as the sole-super power in the world as well as the rise of multi-polarity. Moreover, it should be noted that India has always considered itself to be the regional hegemon of South Asia, whereas Pakistan has always refused to accept India’s hegemony. This defiance of Pakistan and its refusal to yield to India’s hegemony in the region and its demand to be treated on the same level globally has never been accepted by the Indian establishment and policy-makers. Hence, that has led to regional destabilisation and tensions. The third is the domestic level. Domestic politics have deeply impacted relations between the two countries. Domestically, the ultra-right and the hard-line factions in both countries have maintained a constant pressure on the governments of both sides and on occasion have forced the countries to behave or adopt a certain policy which the governments in ordinary circumstances might not have taken. This appeasement to the right wing has been witnessed numerous times and has more times than not resulted in stagnation of the peace and dialogue process. In recent times, the 2002-2003 stand-off between Pakistan and India and the Mumbai attacks of 2008 bear witness to this fact. These tensions not only put a stop to the on-going peace process between the two countries but also held off any advances that might have accrued if the talks had continued. It would not be wrong to assume, perhaps, that the reason that Pakistan and India have not been able to achieve a breakthrough on a single core issue has been because of the internal domestic pressures. Ideological polarization can be considered as one of the factors which have impacted, rather severely, relations of the two countries. Pakistan and India are neighbouring countries whose future is entwined and dependent upon each other. It is up to the two countries to find a way that leads to peace and prosperity of not only the two countries but also of the region.